Also serving communities of Atlantic Beach. There are 16 Memory Care Facilities in the Jacksonville Beach area, with 1 in Jacksonville Beach and 15 nearby. The average cost of memory care in Jacksonville Beach is $6,412 per month. This is higher than the national median of $4,650. Cheaper nearby regions include Ponte Vedra Beach with an average starting cost of $4,392. To help you with your search, browse the 9 reviews below for memory care facilities in Jacksonville Beach. On average, consumers rate memory care in Jacksonville Beach 5.0 out of 5 stars. Caring.com has helped thousands of families find high-quality senior care. To speak with one of our Family Advisors about memory care options and costs in Jacksonville Beach, call (855) 863-8283. Jacksonville Beach is a seaside city that is part of the Jacksonville Beaches communities, including Ponte Vedra Beach, Atlantic Beach, Neptune Beach and Mayport. It is home to more than 23,500 people, of which 17.5 percent, or 4,115, are 65 years of age or older. Jacksonville Beach is located in Duvall County, where an estimated 16,374 citizens suffer from Alzheimer's disease or dementia, according to Elder Affairs. Assisted living facilities offering extended congregate care must be licensed by the state to provide treatment for cognitive impairments. There are 16 ECC-licensed facilities in the Jacksonville area with one in Jacksonville Beach and the rest in nearby communities. Jacksonville Beach receives an average of 49 inches of rain yearly, which is 10 inches more than the U.S. average. While winter temperatures do drop as low as 45 degrees, Seniors may like that they will not see any snow fall here. There are 217 sunny days every year — 12 more than the U.S. average, and summer highs top out at 90 degrees. Sperling's Comfort Index for the area is an impressive 79 out of 100, compared to the national average of 54. Jacksonville Beach is home to world-class medical facilities, including those specializing in brain health and dementia care such as Baptist Medical Center Beaches' AgeWell Center for Senior Health and St. Vincent's Medical Center Southside/Ascension in the event of medical emergencies or illness. 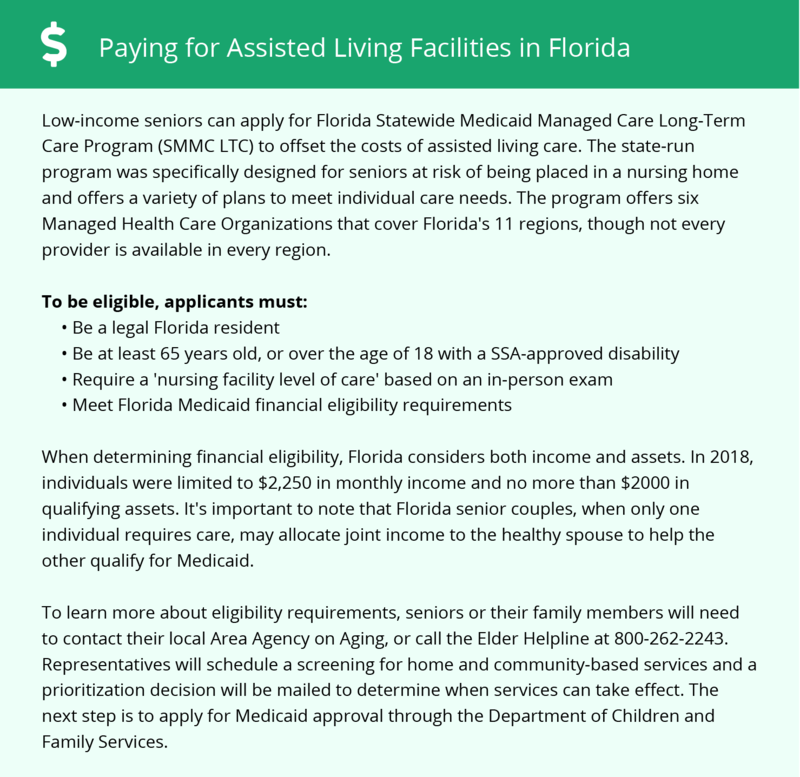 Since Florida does not tax wages, seniors in memory care have extra room in their budgets for daily living expenses and memory care services. Duval County's air quality receives a "C" grade from the American Lung Association. This means that the air quality is poor and may irritate seniors with asthma, lung cancer, CV disease, COPD and diabetes. Seniors may want to speak to their doctors about how air quality in Jacksonville Beach may affect preexisting respiratory conditions. Memory Care costs in Jacksonville Beach start around $6,412 per month on average, while the nationwide average cost of memory care is $4,799 per month. It’s important to note that memory care rates in Jacksonville Beach and the surrounding suburbs can vary widely based on factors such as location, the level of care needed, apartment size and the types of amenities offered at each community. Jacksonville Beach and the surrounding area are home to numerous government agencies and non-profit organizations offering help for seniors searching for or currently residing in an assisted living community. These organizations can also provide assistance in a number of other eldercare services such as geriatric care management, elder law advice, estate planning, finding home care and health and wellness programs. To see a list of free memory care resources in Jacksonville Beach, please visit our Assisted Living in Florida page. Jacksonville Beach-area assisted living communities must adhere to the comprehensive set of state laws and regulations that all assisted living communities in Florida are required to follow. Visit our Memory Care in Florida page for more information about these laws.